We went from a couple to nine international routes in what seems like no time at all. Based on international passengers, San Jose had the 4th fastest growing airport in the country between 2012 and 2016. I would actually argue that we led the country in international growth. 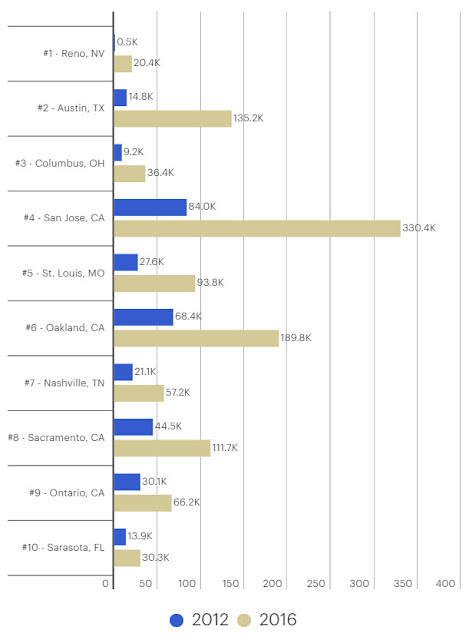 Reno, Austin, and Columbus were the top three and all of them had almost 0 international travel in 2012. When you take a number close to 0 and add anything to it, you are going to get a very large percentage. San Jose went from 84,000 international passengers in 2012 to 330,400 in 2016. That growth of quarter million passengers is not only far more than any other airport on the top 10, but it is greater than the rest of the top 5 combined. SJC also had more passengers in 2012 than any other airport on the list--the larger you are the more difficult it is to grow. This makes the growth SJC has shown even more impressive.